One-Piece Custom Shower Floors From Handy Man! The days of using a rubber “floor pan” and tile shower floors are over. There is a much better way. 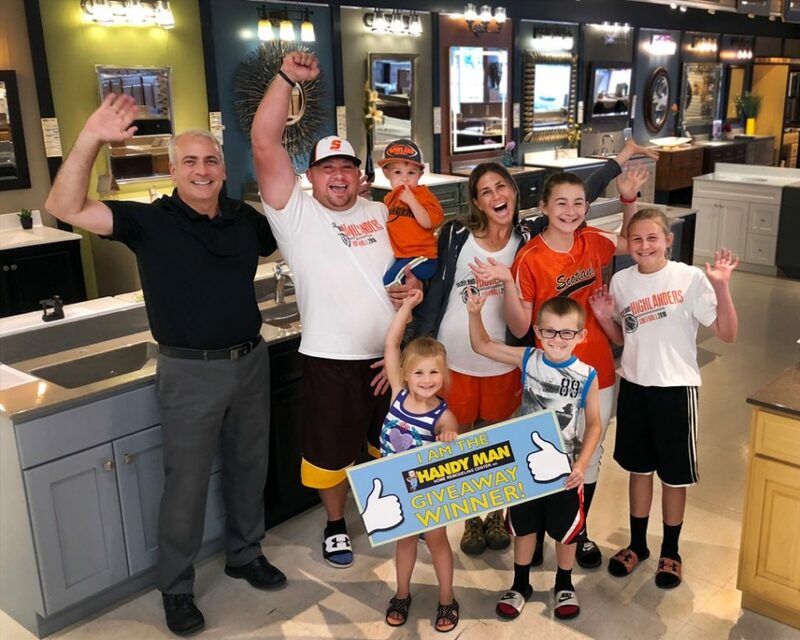 In the never-ending pursuit of “taking things up a notch,” Handy Man is more excited than ever to tell you about the opportunities we have to help you build your perfect custom shower! 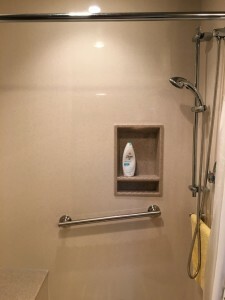 A typical Handy Man “custom shower” consists of a shower base and one or more wall panels. An endless variety of custom shower configurations are possible from simple rectangles to elaborate walk-in designs. You can use complete shower systems or choose a base and do the rest in tile. 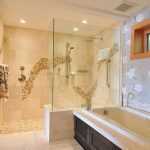 Steam showers are also gaining in popularity and are an easy addition to your existing bathroom during construction or remodeling. A popular item is the Onyx shower base that truly stands up above the rest. Onyx custom shower bases are a single unit for easy, worry-free installation. With no seams in the base for you to caulk, you will never have to worry about leaks developing in the future. For a distinctive look, several different trim options are available, as well as contrasting stripes, borders, and even graphic inlays to enhance the beauty and uniqueness of your shower. When we say “customize” we mean it. At Handy Man, we can help you with rain shower heads, body/massage spray heads and any other shower head you desire. In our showrooms alone, we have over 60 different shower heads to choose from. So, what are you waiting for? 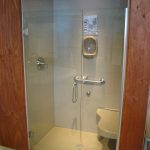 Come and visit Handy Man’s “waterpark” and physically feel and see these custom showers at work. Handy Man has a qualified staff that can walk step by step with you to help you design your own shower. 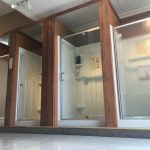 We pride ourselves on our uniqueness and our customer satisfaction when it comes to bringing you a “Custom Shower System” like no other! Handy Man on KELOLAND Living! Learn how we can help you live in your own home longer! Read about some of the items we mentioned in the video by clicking on the links below. Read about more Independent Living options available to you here! Germaphobes unite! The bathroom tends to be a breeding place for germs – but it doesn’t have to be. We have compiled a handful of helpful bathroom hacks to keep you and your bathroom clean and bacteria-free. First, let’s focus on the dirtiest place – the toilet. In recent years there have been a ton of advances in technology, and the toilet was not left out. These changes have made toilets cleaner. 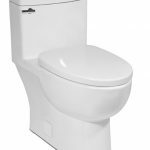 Consider purchasing a one-piece skirted toilet which has a smooth base instead of the visible curvy trapway seen on traditional toilets. They are much easier to clean and do not gather as much grime. If you prefer a two-piece toilet, make sure the toilet you buy has a sanitary bar which prevents liquids from accumulating under the tank. Take the toilet one step further and get a wall-mounted toilet. Cleaning the floor is a breeze since you don’t need to worry about cleaning around and behind the porcelain throne. If the flusher grosses you out, install a touchless flush. These easy-to-install mechanisms are fairly universal and work on most toilets. Once installed, all you need to do is wave your hand over a spot above the tank to flush. Bidets (personal cleansing systems) are slowly making their way to the United States – and for a good reason. 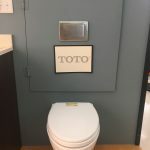 They are incredibly hygienic and although full systems can cost up to $1,000, simple washlet seats can be found for under $100. The most visible grime can be found on the vanity and sink. Like the toilet, consider installing a wall-mounted vanity. The floor is much easier to clean when there aren’t corners to sweep around. 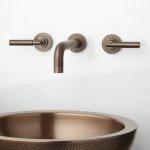 You can also purchase a wall-mounted faucet as well. 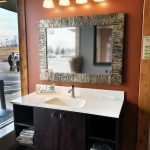 The perfect combination is a wall-mounted vanity, wall-mounted faucet, and a single-piece Onyx vanity top. 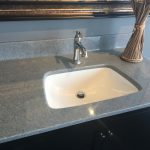 Instead of a countertop with a separate sink, it is one seamless piece. This makes cleaning a breeze. When the faucet is mounted, you can simply wipe down the whole countertop and sink in one smooth move. 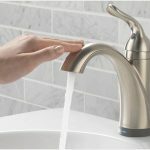 If you don’t like the look of a wall-mounted faucet, another germ-free option is to install a Delta Touch faucet. You can simply tap the faucet with your forearm to turn on the water and not have to touch the handles. The most difficult-to-clean object in the bathroom is the shower. 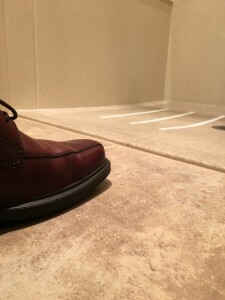 Grout lines between tiles are quick to collect mold and mildew. Remove them completely with a grout-free Onyx shower. The single piece base and walls are easy to wipe down without scrubbing. If you still are using a shower curtain, consider replacing it with glass doors. Curtains collect mildew and shower scum while doors are easy to wipe down after each shower. Even better, design a doorless shower. These are cleverly located showers with the showerhead facing away from the entrance so you don’t even need a door. Imagine the time you will save with an easy-to-clean bathroom! Consider making a few of these changes to your home. At Handy Man, we’ll walk you through it! Congratulations to our Onyx Top Giveaway Winner! 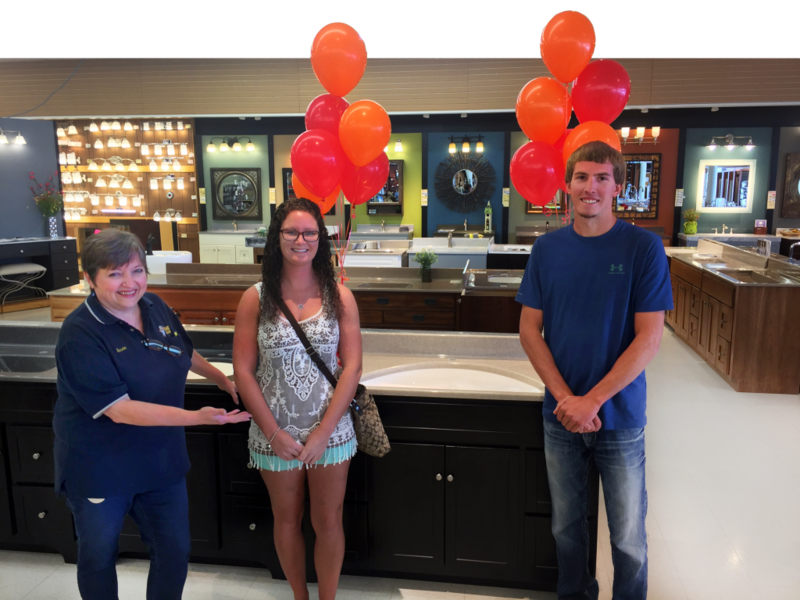 Nichole signed up for our Onyx vanity top giveaway and won! Congratulations and thank you for entering! As you grow older, you may notice that your bathroom does not grow with you. Simple tasks such as showering can become daunting. At Handy Man, we have the tools you need to update your bathroom to a functional space again. These changes can make a genuine difference. Start by installing grab bars throughout the bathroom for added stability. Each year 3,500 people suffer from a fall in the bathroom. 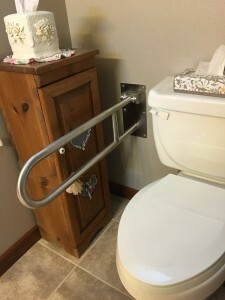 Grab bars are an inexpensive way to prevent falls. Place grab bars throughout the bathroom – vertically near the shower or tub; horizontally on shower walls, near the toilet, and even consider replacing your towel bar with a grab bar. Consider installing a taller toilet seat. Your current toilet is probably between 14 and 16 inches tall. 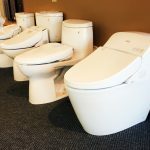 ADA compliance sets standards for toilet seats to be raised between 17 and 19 inches. These “comfort height” seats make it much easier and safer to transition between sitting and standing. An Onyx shower can be totally customizable to your needs. Low clearance shower bases are only a fraction of an inch tall, which means you can walk in, or roll a wheelchair in with ease. Installing a bench in the shower means you can sit while showering, decreasing the chances of slipping and falling, while handheld shower sprayers allow you to control the water. Walk-in tubs offer a great alternative for those who prefer baths to showers. 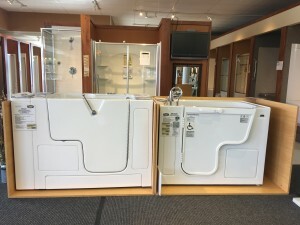 Their sealed doors ensure that water does not leak, and they can come with quick-fill and quick-drain capabilities to get you in and out quickly. No matter what your needs are, we have the tools to help you find exactly what fits your lifestyle. 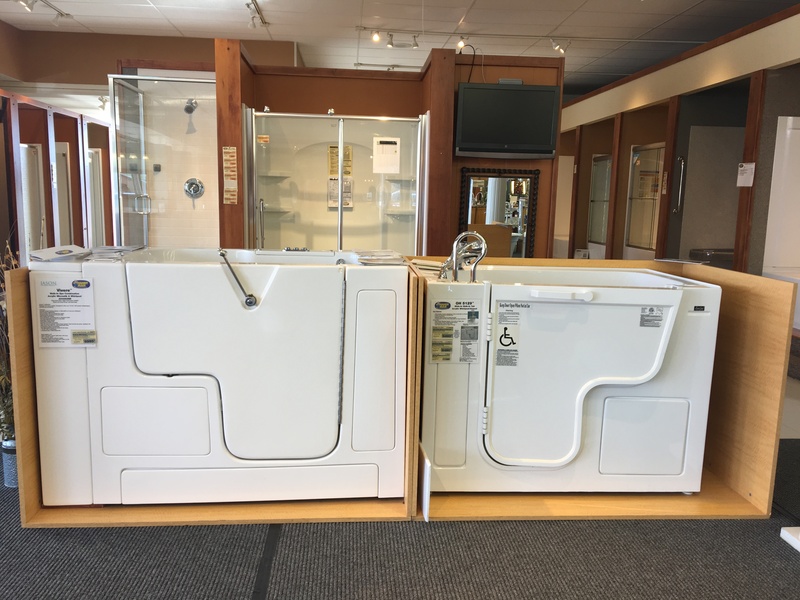 Our showroom has a variety of ADA compliant tubs, showers, and toilets on display so you can visualize them in your home. We look forward to bringing you the freedom to live in your home for years to come!